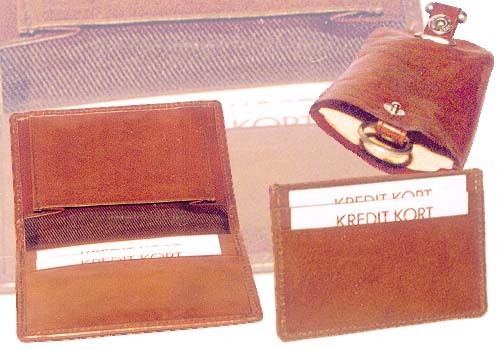 Description : An elegent card-holder crafted from Italian leather from Italy. On opening, the RHS has a pocket with an expander; the LHS has three card slots. Size: 7.5 cm x 11 cm. Description : An extremely convenient cardholder to carry around. It is crafted from the finest Italian Alba Tampono and the size is 10.4 cm x 6.8 cm. It has two slots on both sides. From the top there is a slot to keep more cards. Description : From the same Italian-leather range, a key case for the car. It has a ring to hold the keys and can be collapsed inside when not required. The size at the mouth is 7cm and the length is 11.8cm. A strip that will close with a press button can pull the keys inside.